When Richard the Lionhearted died in 1199 AD (when he was 42), his younger brother John became king. The lords (the rich men) of England hated John. They hated him partly because John had taxed everyone so much to pay for the Third Crusade. And they also hated him because John seems to have just been a nasty suspicious kind of person. Compared to Philip Augustus, who was king of France at the same time, John looked weak. Philip Augustus wanted John to have less power. So Philip chose to support the claims of another man, Arthur, to inherit Normandy instead of John. Arthur was John’s nephew. He was the son of John’s older brother Geoffrey who had died. John tried to solve this problem by capturing Arthur and having him killed. But this murder upset the lords of Normandy and Anjou. They decided they would rather Philip ruled them instead of John, so they agreed to fight on Philip’s side. By 1204 John lost most of his land in France after all. Once the French land was lost, the English lords began to really see England as a country and to think of themselves as different from the French people. It was about this time that English first started to really take shape as a language. (Before John, the lords in England all spoke French.) Chaucer wrote about this time – in English. John continued to fight with everyone and lose: first with the Pope, who excommunicated him, and then when he tried to get his land in France back. By 1215 the English lords had had enough of this loser, and they got together an army and marched on London. They forced John to sign the paper they put in front of him, which is known as the Magna Carta. (Magna Carta means “Great Letter” in Latin). This letter wrote down two new ideas. The first was that the king had to obey the law, like other people. And the second idea was that if the king broke the law, the lords had the right to remove that king and choose a new one. The lords formed the council of the king, and that council could stop the king from doing things if the council thought they were wrong. In particular, the king could not collect new taxes unless the council said it was okay. King John died of dysentery (like his older brother Henry) the next year, in 1216, when he was 49 years old. His son Henry III became king after him. Cite this page: Carr, K.E. 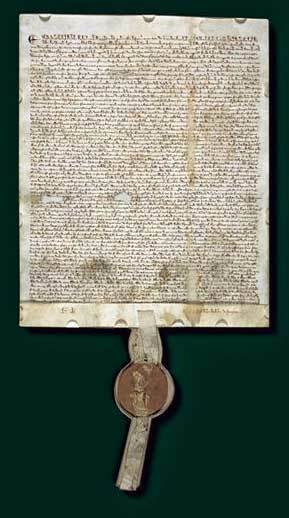 King John and the Magna Carta. Quatr.us Study Guides, August 3, 2017. Web. April 26, 2019.